Will this help with fibromyalgia, autoimmune disease, IBS, panic disorders, and other chronic conditions? When you’ve tried many things to heal and haven’t gotten the results you want, these questions make a whole lot of sense. It’s healthy to be a bit skeptical! It can be hard to believe that major healing and change really is possible. That’s why I want to introduce you to Jayne Eddington. 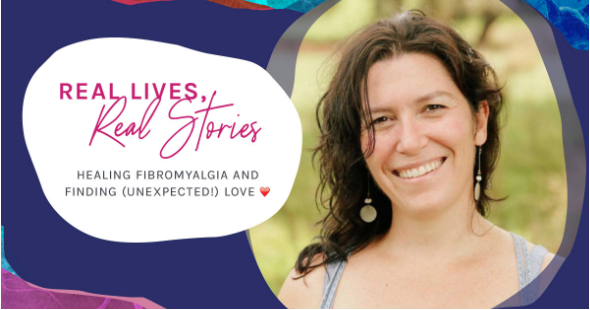 Like many of you, she had tried so many things to heal the fibromyalgia and persistent sense of dis-ease she lived with: osteopathy, naturopathy, acupuncture, counselling, diet, supplements, and lifestyle changes galore! She did see changes, but still felt pain and lacked a sense of general wellbeing and ability to live her life the way she wanted to. Fortunately she didn’t give up because I’m excited to share that Jayne created MASSIVE changes in her life as a result of joining us for SmartBody SmartMind (including finding love, which was completely unexpected!). This makes me smile so big not only because Jayne’s health and life changed so much for the better, but also because she’s such a clear example of what’s possible when we learn to heal at the nervous system level. THIS is what SmartBody SmartBody is all about…learning the right practices, in the right way, and having a whole lot of support to actually do them in a way that works for YOUR nervous system and life. “If you believe in the mind-body connection, if you believe you are the source of your own healing, but just need the tools, then THIS is the program for you. I used to have fibromyalgia. I used to hold everything inside me. Literally. I didn’t feel much of anything (except pain). I was ‘happy’ enough but with no sense of joy. I felt kinda helpless to help myself beyond the physical (osteopath, naturopath, acupuncture, diet and lifestyle – all since 2002) and when my subconscious told me it was time to start taking a look at what I hadn’t seen, my mind freaked out and had no way to file or process and it resulted in a deep, dark pit of depression and despair. Fast forward to me creating (another physical) supplement regime that avoided pharmaceuticals to stop myself from taking my life, and some excellent counselling, and I was able to see that I needed something more. In September 2016, I stumbled across Irene’s free Healing Trauma intro videos that are the informational series to the 12 week program. I had done SO much myself, I had healed as much as I could, but I was at a loss with persistent dis-ease and lack of overall sense of wellbeing… The emotional side of things and the mind body connection were missing. Watching the three-part video series, I was riveted. I felt compelled! It spoke to me in a way no other therapy had! Could I really gain the tools to help myself to heal? Could I really stop myself from responding to stress the way I always had? Really? I went to the dentist the other day, and had ZERO anxiety! For as long as I can remember, the dentist = stress response. I no longer have continual pain in my hip/body. I used to hold anger in my right hip. Now I have the tools to release any pent-up anger and frustration in a constructive, health-promoting way, no longer holding onto it to manifest as physical pain. I have such a sense of freedom. SO much has opened up in my life. I can FEEL and I am ok with that, vulnerability suits me it seems. I feel more generous with my time. I am easily a hermit ordinarily. I see an osteopath on occasion as opposed to almost weekly as a necessity. I work through stressful situations in a flash to the point that they are no longer an issue. I can have repressed memories crop up and deal with them powerfully, not be consumed by them. Issues with people in my life? Meh, sorted in an instant without drama on my part… Illnesses around me this winter (I’m in NZ) nada, I have been exposed to SO much and had nothing at all… AND… I am experiencing JOY, every day. My past isn’t coming back to haunt me, it is coming back to heal me. I am healthy. My bloodwork and alternative tests look fabulous. No liver toxicity, no chronic inflammation, no regular pain. I had done A LOT of work myself prior to this course, and, although I have learnt a ton and have no regrets, if I could have my time again, I would just invest in this course. I have found love, I am IN love. I am in a relationship with a really awesome man (it’s a recent thing). I was single my whole life (on purpose) and unable to engage, or even if I am honest, consider the possibility of engaging prior to this course. Things are on track for happily ever after and I wondered if it would ever happen. A WHOLE lot of stuff needed to not just change, but transform, before this was going to happen and now it has and IS happening. I needed to be able to love myself first. And THAT started with acceptance. This program is a journey of self discovery, of letting go of what is not serving you, of gaining the ‘things’ you need to live your life from a place of health…whatever that means to you. You can take it at your own pace, you can stop and start if you need to, you are accepted at wherever you are in your journey, there is no pressure, you are the skipper of your ship. There is incredible support offered by Irene and her team, but also the alumni and other participants. You are not alone. You must DO the work, but if you do, the results are INCREDIBLE. I know this, because I am living proof of it. If you’re new to this deep nervous system work, know that many folks find that at its heart, it’s about becoming who YOU truly are and finally learning what it means to go from living in a state of survival, stuckness, and anxiety to a place of hope and potential. As Jayne shared, you must do the work to get the results (and they don’t happen instantly), but when you do, healing WILL come and the results are often incredible! Many SBSM alumni experience big shifts in their health and their lives over time. If you want to meet more of them, head on over to our client stories page. If you’re ready to finally get to the root of things and create profound change in your life, then join us for SmartBody SmartMind! We’d love to have you there.